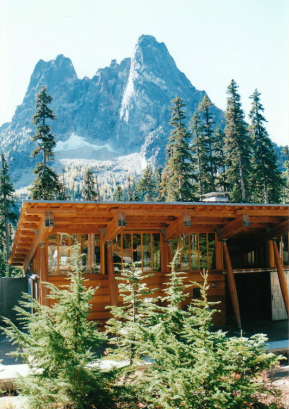 The visitor center includes extensive wood and stone elements to harmonize with its alpine setting. A beefy roof structure is needed to resist the alpine location’s extreme wintertime snow loads. 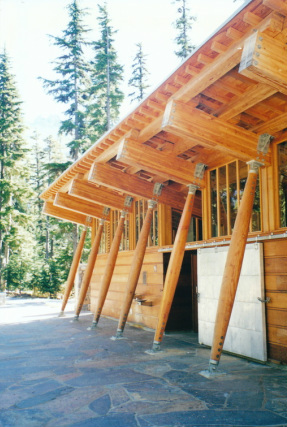 Project Summary:	This visitor center’s location at 5,400 feet elevation high in Washington state’s North Cascade mountains presented inherent and severe environmental challenges. Deep snow accumulations and sub-freezing temperatures preclude all access to the building from early winter till late spring, leaving the structure buried in snow nearly half of each year. Such environmental extremes provide much opportunity for leakage and degradation. To address the site’s challenging climate, the visitor center, composed of a heavy-timber wood frame structure, shelters its exterior walls with wide roof overhangs. Its standing seam metal roof slopes in one direction to shed snow away from its entry side. Its more exposed walls consist of concrete clad with stone veneer, while sheltered areas are framed in wood and clothed with wood siding. PL:BECS Services:	PL:BECS consulted to the architect in the selection of materials, products, and methods for the building’s sub-grade waterproofing, stone veneer masonry, penetrating masonry repellents, and other exterior envelope claddings.